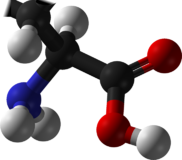 A ketogenic amino acid is an amino acid that can be degraded directly into acetyl-CoA, which is the precursor of ketone bodies. This is in contrast to the glucogenic amino acids, which are converted into glucose. Ketogenic amino acids are unable to be converted to glucose as both carbon atoms in the ketone body are ultimately degraded to carbon dioxide in the citric acid cycle. In humans, the remaining thirteen amino acids are exclusively glucogenic (i.e. are not ketogenic). This page was last edited on 20 April 2019, at 13:54 (UTC).